Although it’s not the most photogenic food (I tried! ), I. Love. Spanakopita. So much that I might name my first child Spanakopita. I could even probably get it tattooed on my lower back. Alright, maybe not, I could see society being unwelcoming of both a child named Spanakopita and spanakopita tattoos (people are narrow-minded! ), but my point is just that I owe the Greek people a major tribute because they have given me the gift of one of the world’s most delicious foods: spanakopita. I thought my romance with spanakopita was a thing of the past when I switched from being mostly-vegan to entirely vegan back in 2010. But then for summer potluck at the former Mercy for Animals HQ in Chicago, a fellow intern brought in a pan of the most amazing spanakopita. The Greek-American angel who served as my spanakopita savior is my friend Alison Vellas, who is, in addition to a badass animal advocate, an incredibly talented artist whose work you can view here. I would argue that Alison’s spanakopita is even better than its dairy counterpart. 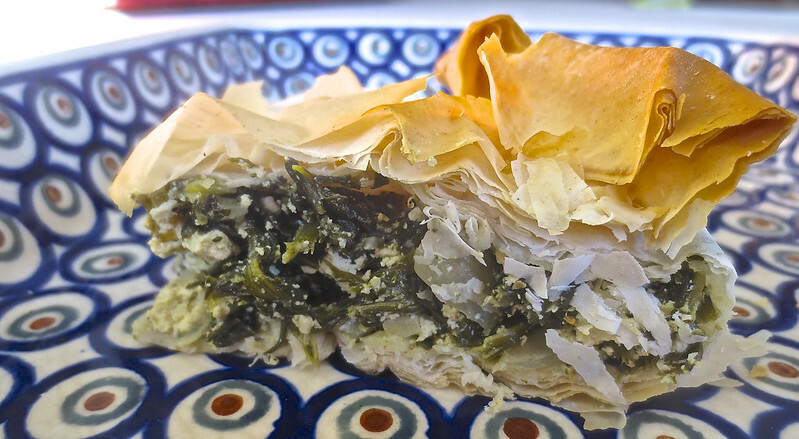 You get all of the exquisite flavors of spanakopita without the heaviness of feta, which always took a toll on my stomach. Plus, it has the stamp of approval of my friend Eleni, who is an authority on all things Greek. If I recall, when I made this recipe for Eleni, she remarked that it tasted like her γιαγιά’s. The recipe below is almost exactly Alison’s original, with just a few adjustments. Thank you Alison for this amazing recipe! 1. Preheat oven to 350F. Coat a large baking dish (large enough to fit the size of your phyllo sheets). 2. Press tofu by putting it on a plate and placing something heavy on top, like a stack of bowls. Leave to press water out for fifteen minutes. 3. Sauté onions until softened. Add spinach, garlic, green onions and dill. Cook for five minutes. 4. Remove the spinach mixture from heat. Let cool, and then transfer into a strainer with small holes, squeezing out as much water as possible. 5. Crumble the tofu into a bowl with your hands until it is in finely crumbled. Add the nutritional yeast, olive oil, lemon juice, and vinegar. 6. Add the spinach to the tofu, and add the spices, stirring well, and adjusting spices to taste. 7. Divide your phyllo dough into two stacks, with one stack having about ¾ of the package’s sheets, and the other having 1/4. 8. Place a stack of four or so sheets into the baking pan, using a pastry brush to coat the top sheet with olive oil. Repeat, layering the phyllo dough in increments of four sheets before oiling again. 9. After you have gone through the ¾ stack, spread the spinach and tofu mixture onto the pan. Then begin to layer the ¼ stack on top, placing four sheets down before you brush the dough with more olive oil. When you place the last sheet down, coat the top generously with olive oil. 10. Place the pan in the oven and bake until golden brown, about 40 minutes. Cut into squares and devour warm or at room temperature. 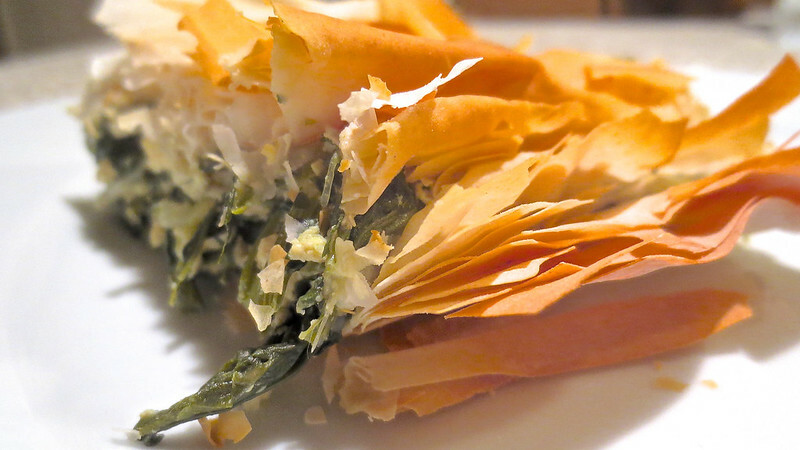 This entry was posted in entree, side dish and tagged dill, feta, food, greece, greek, phyllo, recipe, spanakopita, spinach, tofu, vegan, vegetarian. Bookmark the permalink.